With this website valuator script you can get any informsation about a site. 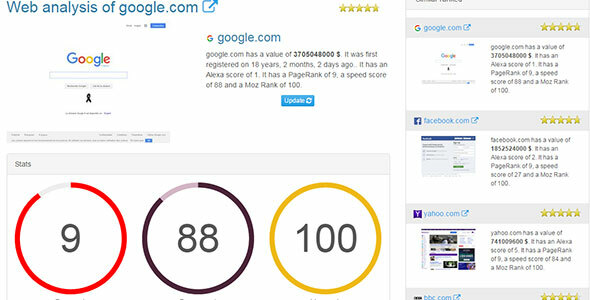 You can check worth of a website, its page rank, page speed, domain authority, traffic statistics, Semrush graphs, Alexa graphs, website safety statistics, SEO statistics, social media statistics, domain and web server statistics, whois details. Itâ€™s based on bootstrap, so itâ€™s fully responsive. Comes with an admin panel where you can change settings, add your custom ads, add analytics code, your API key from Moz, Google, Web of Trust.